Having three kids aged 5, 3 and 1 we always have problems what to allow them to bring to the Holy Mass. The oldest son understood that taking rattling cars to our church was not a good idea and he was satisfied with Christian books for children. Our daughter, though, is a touchy - feely type and books are not the right thing for her during long sermons. We searched for something Christian that can be carried around and cuddled but there wasn´t anything. We have carried the idea of making a soft Jesus in plush in our minds for almost a year. We have prayed over it and now we want to share it with everyone. Finally our kids have the sweet plush toy Jesus to play with, sleep with and to carry around. We will be happy to hear that your kids like it, too. 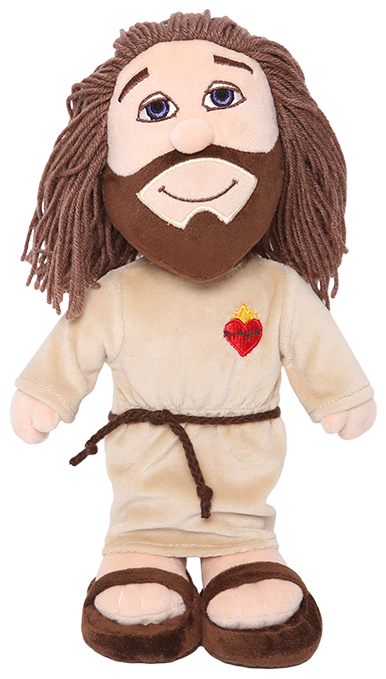 Our Plush Jesus is made of extra soft plush and your children will love to cuddle it when falling asleep. Jesus figure is 30 cm/18 '' tall which makes it easy for children to hug. It is warm and its smile brightens up each morning. 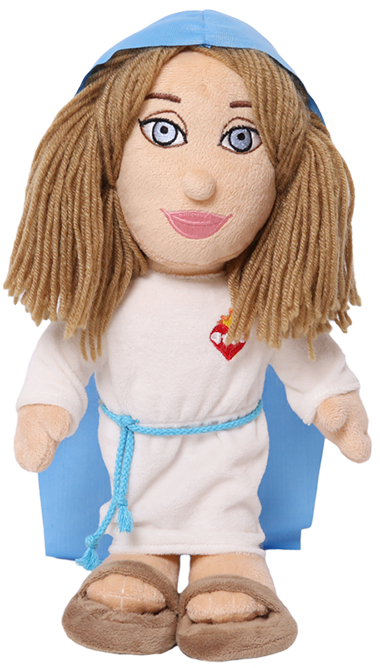 Plush Jesus can be used as great help while praying with children. Jesus figure stands and in this way it shows one of the right positions for praying (unlike rolling on the bed as our children prefer the most :-D). Its kind face helps even the laziest little bum to give thanks and to say prayers to our Heavenly Father. The embroidered flaming Sacred Heart crowned with thorns will help you to explain how much Jesus loves us. The Plush Jesus is a perfect toy for a quiet play during long sermons. It is easier for children to imagine and re-act stories from the New Testament when a realistic Jesus figure is at hand. We have designed our Plush Jesus figure according to the painting of the Divine Mercy as it appeared to st. Faustina Kowalski. You can therefore always give your children a mission to find the real painting of the Divine Mercy in the church during the Holy Mass. Jesus Christ is Emmanuel - God with us (Matt. 1:23). Therefore we do not find it offensive, when children engage Plush Jesus figure in their everyday activities. 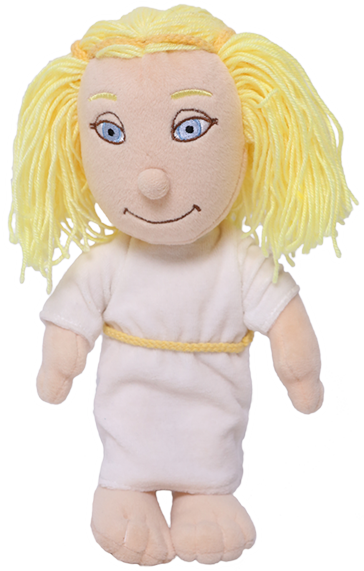 Plush Jesus can be used to bring alive stories from the New Testament - it can heal sick dolls or multiply bread and fish. Check our FB page for many ideas for hands on Bible studies: in English MercyToys UK or Mercy Toys US, in German MercyToys Deutschland @PluschJesus and in Polish MercyToys Polska @JezusPluszowy. 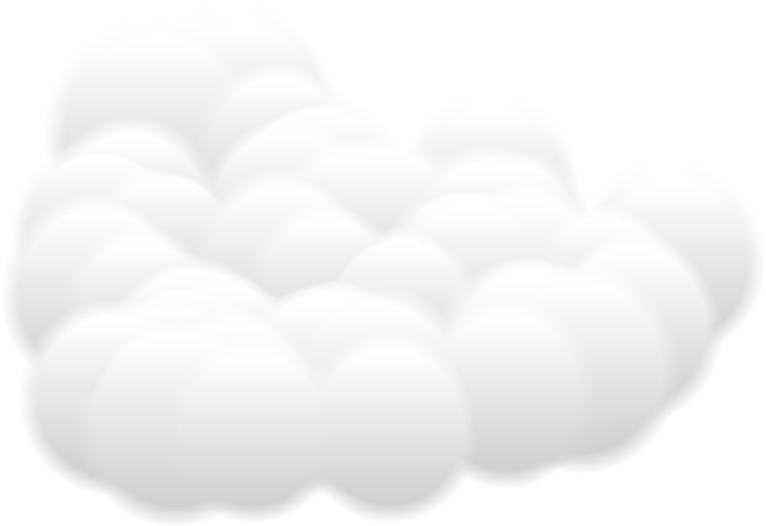 Plush Jesus figure can be also used in ordinary games. Plush Jesus can be a guest on tea parties with dolls, it can take a stroll in a baby stroller as well as watch car races of your son. Please note, that the Plush Jesus figure depicts the Son of God therefore it should have a special place in every children´s room! There are so many appropriate ways how to play and your children will surely come up with many interesting games! We don´t keep everything for ourselves! 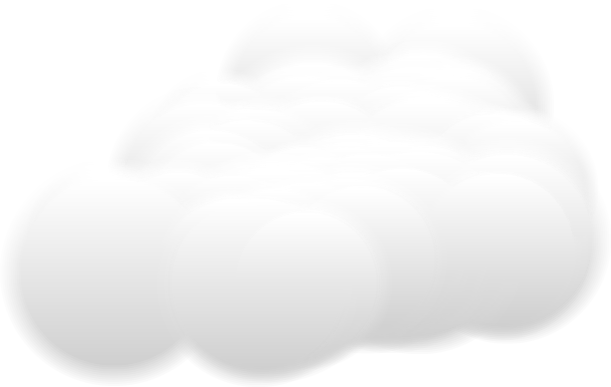 ideas about any other reliable Christian charities which promote cooperation between all Christians in fighting against poverty please contact us.